Last week was a week to celebrate. My birthday and then our one year wedding anniversary. I can't believe that it's already been a year and we still have to plan our reception and for that matter even pick a date. The big move last year took most of our time and energy and this year involved work and career changes. Thankfully, neither of us have been pressed to plan a wedding in a hurry but I know it needs to be taken care of. I'm leaning towards something small with family and close friends with a lot of food, drinks and fun. Renee of Will Frolic for Food had a wonderful idea to celebrate spring with an edible flower virtual potluck. Do check the collection of recipes on her site, so many wonderful sweet and savory takes that all include edible flowers in some sort of delicious way. To celebrate all these milestones in my life, I made a flourless chocolate cake that's infused with orange blossom water. Orange blossom water is one of the most delicate floral flavors to work with and it is delicious! 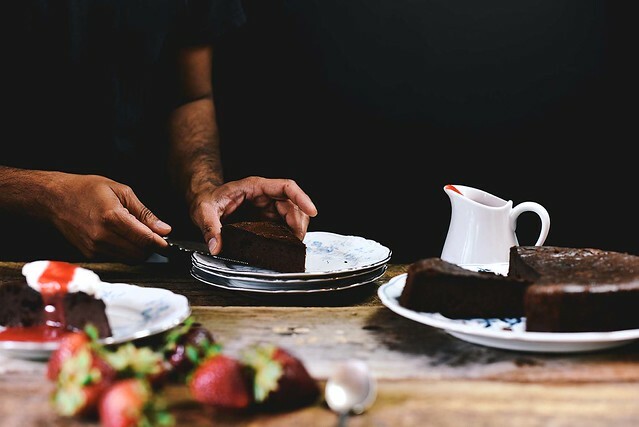 Since the flourless chocolate cake has a deep dark chocolate flavor, I've balanced it with lightly sweetened whipped cream flavored with orange blossom water. And of course, since it was a celebratory occasion, champagne and strawberries in a sweet sauce seemed very fitting! Flourless cakes are pretty easy to make, I think of them as sweet chocolate frittatas. Eggs, butter and chocolate. Few ingredients with a rich flavorful outcome. Use good quality dark chocolate and orange blossom water (that's less than 6 month's old) for the best flavor. Though you can use frozen strawberries to make the sauce, I recommend using fresh because you can taste how sweet they are and then you can adjust the sweetness of the sauce by adding less sugar. I like dark chocolate in this combination because it is not too sweet. 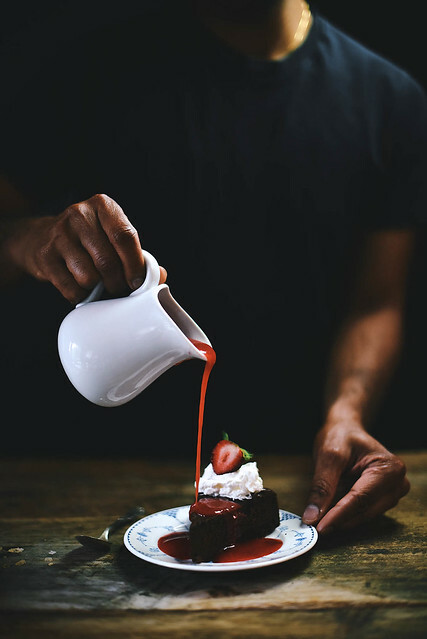 The strawberry sauce will give that pop of sweetness along with the light floral flavor of the orange blossom water in the whipped cream and cake. 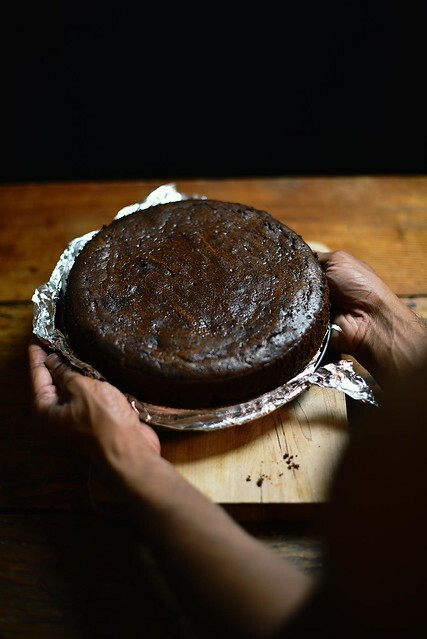 I've spoken to a few people about flourless chocolate cakes and some use a water bath to bake the cake, as chocolate can burn easily. However. I did not have any issues baking it directly in my oven when I skipped the water bath. 1. Place a wire rack in the middle of the oven and preheat to 350F. Line a 9 inch springform pan with parchment paper or aluminum foil. Grease with butter and keep aside until ready to use. 2. Place the eggs in the bowl of a stand electric mixer and using the whisk attachment, whisk the eggs on high speed for about 6 to 7 minutes until the eggs have doubled in volume and appear pale yellow. Keep aside. 3. 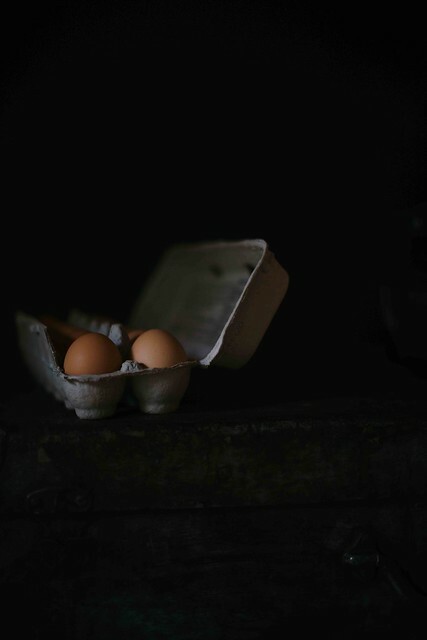 While the eggs are whisking, place the butter and chocolate in a large heatproof bowl and place it over a saucepan containing simmering hot water. Stir with a silicone spatula until it is completely mixed. 4. 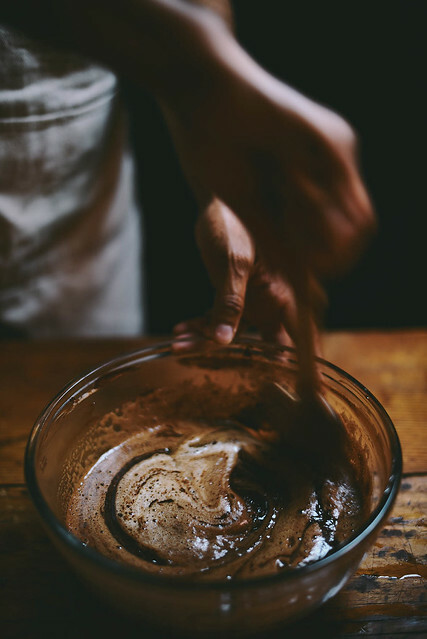 Pour half of the whisked eggs into the bowl containing the chocolate and using an outward to inward movement, fold the mixture to incorporate. Add the orange blossom water and the remaining whipped eggs and fold until combined and no visible flecks of the eggs can be seen. Pour the batter into the prepared pan and bake for about 20 minutes until the center of the cake is firm to touch. Allow the cake to cool to room temperature in the pan. Then using a sharp paring knife run the knife between the cake and the pan and release. Serve the cake chilled with orange blossomed infused whipped cream and strawberry champagne sauce. 1. 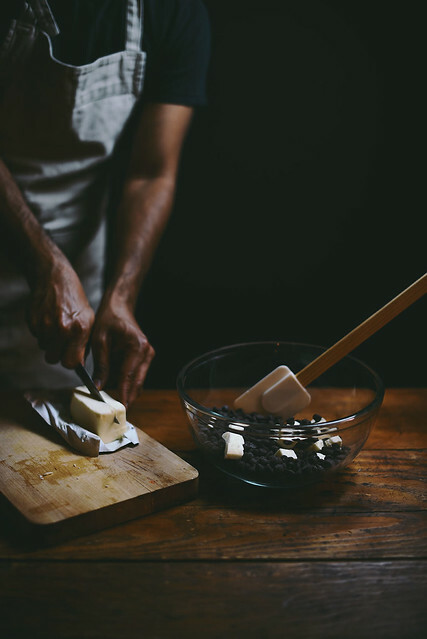 Place all the ingredients in a medium sized mixing bowl. Whisk the ingredients using an electric mixer for about 5 minutes on medium-high speed until the cream becomes stiff. (Do not over-whisk or you'll end up with butter). 1. Place all the ingredients in a large saucepan. Bring the mixture to a boil and then reduce the heat to a gentle simmer. Cook for about 4 minutes with occasional stirring until the strawberries have become soft. 2. Remove from stove and using an immersion blender or food processor blend until smooth. Strain the mixture to remove any seeds. Taste to adjust sweetness if desired and then return the liquid to the saucepan and boil for 1 additional minute. The sauce will be thick. Refrigerate and serve chilled with the cake and orange blossom infused cream.